Like many things in life, some things are enforced more strictly than others. For instance, if we are exceeding the speed limit by 1-2 miles hour, you don’t expect to get pulled over. The same holds true with some of the regulations at shows. For instance, in Chicago you were never allowed to hang your monitors and now you are allowed to hang your monitors, although they don’t advertise this heavily and some may try to stop you from doing so. It is your option and you have the right to do it if you want to save a few bucks. Although staffing right on the edge of the exhibit space (kind of in the aisle) is technically prohibited, doing so is rarely enforced. Especially if you observe respect of all exhibiting neighbors. I am not saying break rules, but I am saying that some rules have a small bit of flexibility. I would suggest you observe the regulations below, however when it comes to other regulations you may have much greater flexibility. You can also ask for a variance from the show and sometimes they will allow you to break a particular rule. A Standard booth, also called a Linear or Inline booth, is any booth that shares a common rear wall, abuts other booths on either/both sides, and leaves the front side open for visitors. Commonly referred to as “a 10 x 10” because of their typical floor size, standard booths have a maximum height of 8 feet for the rear wall. That 8’ height may be continued onto the sidewalls of the booth up to 5’ from the front aisle. From there, it needs to drop to a maximum of 4’ high. Securing a corner location for your standard booth is ideal because both sides of the booth have aisle exposure and garner the most traffic. One important note: hanging signs are NOT permitted over Standard Booths. A Perimeter Wall Booth is simply a Standard Booth which is positioned against a perimeter wall of the exhibit floor instead of to another exhibit. All of the same guidelines of a Standard Booth apply here except that the height of the back wall can extend up to 12’. The sidewall regulations are the same, as well. As with the Standard Booths, hanging signs are not allowed over Perimeter Booths. At 20’ by 20’ (or larger), the large Island Booth is just what it sounds like – an island. It is a booth surrounded by aisles on all four sides. Although the booths are typically 20’ x 20’, the configuration of the booth can vary. Depending on the hall, the maximum height will vary from 20 to 30 feet. The maximum height should include the allowed signage for this type of booth. There are no limitations on the number of solids walls for your Island Booth. Again, you’ll need to check with particular hall for specifics. 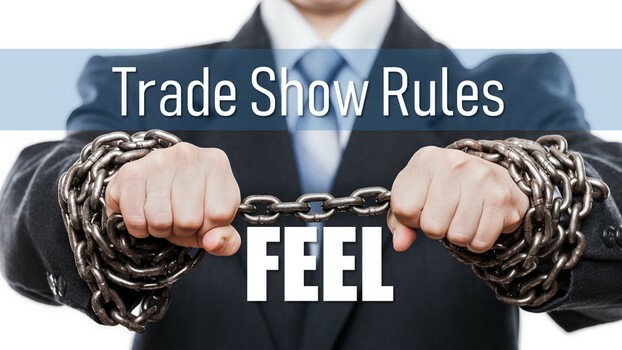 This is the “Wild Card” of the trade show industry and there are few regulations shared in common between shows. Every show seems to have slightly different restrictions on their Peninsula booths. Always check the rules carefully for this at every show you have this space. Similar to an Island Booth, a Peninsula Booth can be a 20 x 20 that shares a wall either with another Standard Booth or another Peninsula Booth (this is known as a “Split Island Booth”). Peninsula Booths have the singular regulation of not being allowed to display logos, ads, or booth ID on the exterior of their back walls. If the Peninsula booth spaces back up to a row of Standard Booths, the back wall can be 12-20’ high at the center and 4’ high for a distance of 5’ from the side aisles. These height restrictions have to be followed for a distance of 10’ from the rear wall. If the Peninsula Booth backs up to another Peninsula Booth, the walls can extend to 20’ high all around. Peninsula Booths are sometimes allowed to have hanging signs for their exhibits. 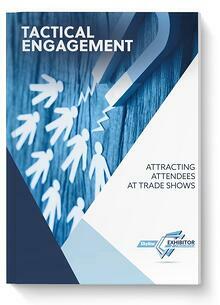 These are the bare bones of regulations for exhibits. 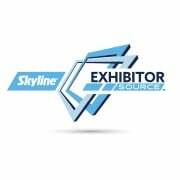 You’ll need to check your exhibitor services manual or your rental agreement if your exhibit has a ceiling, a canopy, any special lighting or graphics, or theatrical trusses. You’ll also need to be aware of any insurance requirements, electrical regulations, and other various rules regarding food, music, or other specific concerns. !